*This story and all of the images are being reprinted with the author’s permission. In my very early days on Facebook, I read a post from Kelly Ann about her mastiff, Riona. To say I was touched deeply would be an understatement. Kelly Ann is a big dog mom of not one, but two, epileptic mastiffs, Riona and Fearghas. A dispatcher by day, fierce epilepsy fighter by night, Kelly Ann’s story is one you will never forget. My hope and prayer is that her story will move you to take action against canine epilepsy in whatever way you feel called. This is the first in a series of articles I will be writing on the subject of canine epilepsy. “I have tried often to write about what life is like with two Epileptic Mastiffs, but quite often the tears take over and I need a break. The ups and downs are difficult, but I wouldn’t give them up for anything. Riona and Fearghas have taught me more about life than the forty-four years leading up to their diagnoses. The tattoo of their names and a purple ribbon on my forearm will be there forever as they will always live in my heart. It’s been almost two years, but it seems like yesterday. It’s a part of my life that I wish I could forget, but would never give up. Canine Epilepsy is something you never hear of, but something that becomes a part of you when it enters your home. It was the morning after the New England Patriot’s lost the 2012 Super Bowl. My twenty-one month old, beautiful brindle girl woke me up with her head jerking back and forth like a sprinkler head and a very distant stare. I woke my husband with my questions, “what are you doing baby girl?” Just then, Riona, a 170 lb. Mastiff, flopped over and started paddling violently as if she were dreaming but much worse. The puppy [Fearghas] is safe in his crate but her sister [Killian] is jumping in my lap scared of her sister’s fit. Thankfully my husband kept her from falling off the bed and supported her head as the minute and a half seemed like an hour. When she appeared to return to us, we were already on the phone with the vet’s office. “Just bring her up” they told us and off we went. My gut knew where we were headed and it was my worst nightmare coming true. The receptionists and vet techs are hugging me upon our arrival as the look of fear on my face was overwhelming. Dr. Cyn looked her all over and did blood work, but nothing was coming back wrong. We knew she had a torn cruciate ligament and were scheduled to see a surgeon that day, but had cancelled when we awoke the way we did. Dr. Cyn gave us a bunch of options and we chose to try to get her into Tuft’s to see Orthopedics and Neurology at once. There was no way I was going to knock her out for her knee until I knew what caused this. We scheduled everything for the following Wednesday. We’ll be okay until then I told myself…well, almost. Tuesday night, the night before her two consults, she had another. Eight days from her first and just as violent…morning can’t come soon enough. I express my concerns about anesthetizing her with what’s going on and we all agree that she needs an MRI. Everyone goes out of their way to schedule everything at once so we’re not putting her out more than once. She will have an MRI, and then go directly into TPLO surgery, but we have to leave her overnight and her procedures will start first thing in the morning. I know it’s the right thing to do, but just can’t stop crying. We leave her but I make my husband promise to go visit her during his overnight shift. It’s a very long night and an even longer day even with the phone updates. Finally I can go see her. She’s made it through everything fine. MRI showed nothing and she now has a metal plate in her knee. Nine weeks in an xpen set up in our bedroom as she’s not allowed to do anything but “business” outside. My little fighter is going to be okay. We’ve started Keppra two times a day to see if we can control the seizures and we do, for a time. As we progress into this epileptic journey, Riona starts to have cluster seizures and Zonisamide is added. Cluster seizures are absolutely the scariest thing I have ever witnessed in my life. My poor girl…don’t cry in front of her. Killian and Fearghas don’t know what to do. In August we establish a “cluster buster” protocol, please make this better. We just want our girl to be better. Saturday morning of Labor Day weekend 2012. The Mastiff puppy that was safe in his crate when Riona experienced her first seizure is awake and panting. Fearghas, who’s too big for his crate now, sounds like he’s all out of breath. We get up to look at him and he’s lying in a pool of drool and shying away from us like he can’t see us. We get him outside and he’s acting totally bizarre. My husband gets him close enough to start checking his abdomen and it is rock hard. We call Dr. Brian, our vet. I’m sorry it’s seven in the morning, but after our description we all agree that baby Fearghas is bloating. Brian tells us to get him to Tuft’s ASAP. I’ll stay home with Riona to give her pills, my husband gets him in the truck and off they go. I call my cousin, who works at Tuft’s, to warm them that Fearghas is on his way and we think he’s bloating. She has the E.R. ready for him as he arrives. Riona and Killian know I’m crying and I tell them that their baby brother is going to be okay. We got him there in time, now I pray that my crying doesn’t trigger a seizure for Riona. My husband waits for the ER doctor. She finally emerges to tell him that she has good news! Fearghas isn’t bloating, he’s having seizures! My husband is devastated. The doctor tries to explain that it won’t cost us all the money for surgery, but my husband tells her we have one epileptic Mastiff already, now we have two. They do tests and blood work just to confirm. Fearghas is diagnosed with Idiopathic Epilepsy. Riona’s neurologist is now involved with Fearghas and calls every few hours to let us know how he’s doing. More seizures. He can’t come home today, but we can visit. Poor Fearghas’ face is twitching and at times acts as if he can’t see us. His panting and drool cause puddles in his kennel. I cry all the way home so I get it out before Riona and Killian can see me. The next morning more seizures, he can’t come home today. The visit is the same and the nurses console us saying how sweet he is. The doctor tells me if Fearghas can make it twelve hours without a seizure he’ll be able to come home so we wait another night. On the third morning, Dr. F calls to tell us he had another at 8 am. [Fearghas] is getting very scared and uncooperative, so he wants him to come home but only if he can make it until 6 pm without one. My husband and I plan to give Riona her 3 pm meds, then go to the hospital and stay with Fearghas, hoping our presence will calm him and keep him seizure-free until 6. The nurses let us take him outside to hopefully relax. His pills are done so one nurse comes looking for us. She was born in Ireland and has fallen in love with Fearghas. She gives him his pills and tells me how handsome he is and that he has human eyes. She remembers Riona being in ICU too with their unique Irish names. Dr. F comes out to see us and gives us the okay to go home with him, giving us the same meds that Riona is on but with the addition of pheno[barbitol]. We would soon learn about the side effects of pheno. His balance is horrible. He looks like he’s been drinking and he drags his front paws. He can’t run without falling over. We are devastated about where our once happy go lucky Fearghas has gone. I keep reassuring my husband that it’s only temporary. I’ve read about this on the Epil K9 list and he’s going to get through it…but will he? He does get through it about the same time beautiful Riona has pheno added to her Keppra and Zonisamide. It’s the end of September 2012 and Riona had her second TPLO surgery on August 3rd, so she is still restricted to an xpen. It’s early afternoon and I hear her pen rattle as I come out of the bathroom. OH NO, I can’t get in there fast enough…the monster is here! Our neurologist has us call whenever she has a seizure, so we call. By the time he calls back, we’re on our fourth seizure. We’re following our “cluster buster” protocol, and he tells us if she has another, to bring her in. It happens again. We get her loaded into the truck and while I run back inside to grab my bag, another [seizure] in the truck. I’m crying, my husband is crying asking if we should just put her down. Two more on the ride and we finally make it into the ER. They walk us right into a room when the ninth one hits. Dr. F is there watching and they bring the gurney in to take her to ICU. He goes off with her, now what do we do? He returns to tell us she’s fine, she is on IVs and they’re going to keep her. We ask about quality of life and should we just put her down? He tells us that watching her is very emotional, but she will be fine. We have plenty of med options and we’re going to get through this. We appreciate his calming effect, but my emotions just let go. We rush home to make sure Killian and Fearghas are okay. Please Fearghas be okay! We both feel like we’ve been hit by a truck. She’s fought to get through her knee surgery, now with adding pheno, how will she walk? We kept a harness on her for a long time so we could help her walk and catch her before she would fall. The side effects lasted about as long as they did with Fearghas, three to four weeks that felt like years. Riona’s struggles with canine epilepsy continue. She’s a fighter and won’t lose to her clusters. In January we added a fourth medication and she made it 39 days with no seizures. We always hope to break her record! Fearghas has experienced focal seizures and no grand mals yet. He does really well but will continue to take meds five times a day for the rest of his life just like his sister. Having had two Mastiffs that lived to eleven and twelve, this disturbing diagnosis creates the constant fear of losing our babies very young. They are so sweet, everyone loves them! As big and intimidating as they would appear, there’s nothing more opposite. Riona visits with an 86 year old man who has Alzheimer’s but always remembers her. Her gentleness makes everyone love her. Fearghas is more shy, but once he’s comfortable, his silly, goofy, behaviors can’t help but make you laugh. Mastiffs are true “gentle giants,” even epileptic ones. Their disease doesn’t change them. They love to play, wrestle, run, and move the furniture. They love to have visitors because everyone that comes over, comes to see them of course. They’ve learned what daddy’s alarm on his cell phone means, time for treats! 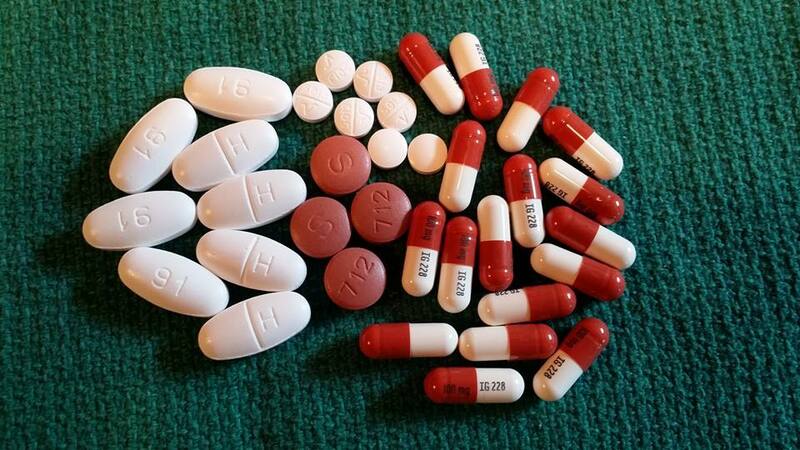 Currently, Fearghas takes 24 and Riona 36 pills a day, spread out at five different times. It’s not medicine though, not to them…with meds comes treats! Bananas, pineapple, melon, cheese, pill pockets, it’s always something they love! We don’t miss out because of their disease, we adapt to it. Friends understand and invite them because it’s med time. They travel with us and their meds so that they’re on time and never missed. They love to ride in “their” truck, they don’t care! They have their own travel bag with all the necessities. When the monster does rear it’s ugly head, it affects all of them. They get nervous if something goes wrong. Non-epi Boxer, Killian, always watches out for her brother and sister. After the monster visits, they wait for each other to feel up to playing tug of war and wrestling in the yard. They know when each other doesn’t feel good and patience will get us through this battle. Best friends they are and wait they will do. It’s always amazing to me the sensitivity and loyalty that dogs have as opposed to us humans. To say we’ve learned a lot would be an understatement. We’ve learned all about canine epilepsy. Not that it helps, but we understand it better. We read everything we can in the hope that maybe we can make a difference in their lives. We’ve learned how short life can be, what’s important, who our friends are, and to value what you have. We’ve learned that no matter how bad it gets, we make it. We’ve met wonderful people who truly care! 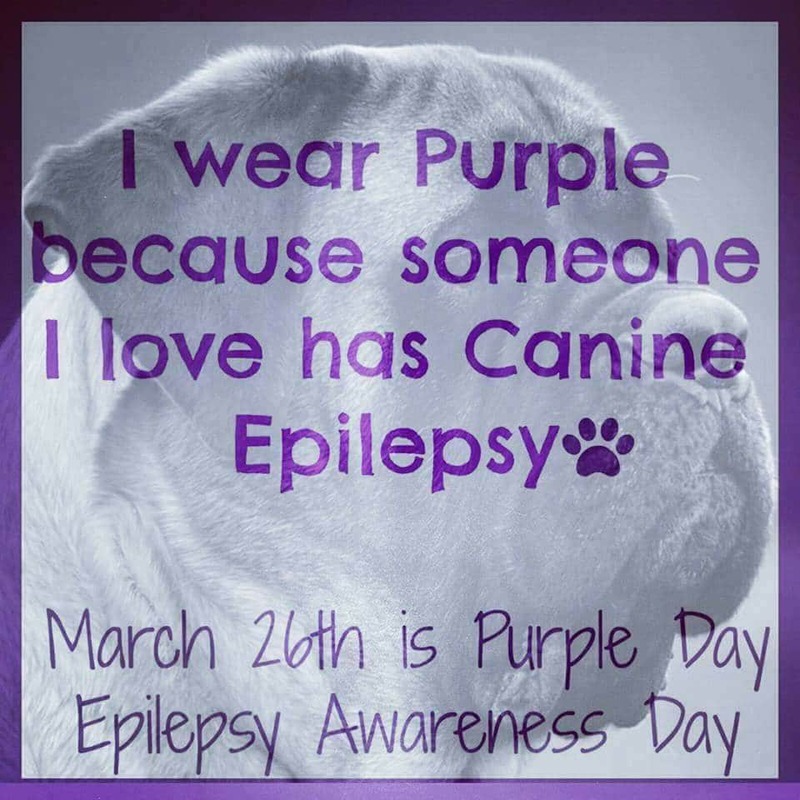 March 26th is Canine Epilepsy Awareness Day. Wearing purple on that day to show your support, while kind, I believe is insufficient for the cause. Consider the following three action steps as well. Share this with your friends, especially those preparing to add a puppy to their home. If you breed dogs, DO NOT breed epileptic dogs. DO NOT breed dogs who have produced epileptic offspring. Period. I hope that is clear enough. Genetic Research! Yes, there are other medical reasons that dogs can have a seizure. From brain trauma or liver disease, to hypothyroidism or nutrition, there are a plethora of reasons a dog’s threshold to prevent a seizure can be decreased. That said, until we have a genetic marker for canine epilepsy, much of the disease remains a mystery. And to further complicate the matter, research has shown that it is unlikely that there is only one canine epilepsy gene in dogs, but rather different forms of epilepsy in different breeds. Read part 2 of this canine epilepsy series where I provide links to the latest research and genetic advances, Idiopathic Epilepsy in Dogs – With Knowledge Comes Power. In addition, read my Interview with Jadem Mastiffs and DNA Testing: Unlocking The Key To Your Dog’s Health for more information on the importance of genetic research and how you can help. If you are like me you want to know more, to help, and to prepare should you ever be touched by canine epilepsy the way so many others like Kelly Ann have. The following are some terrific resources I found during my research that I highly encourage you to check out. I literally had tears in my eyes reading this. As someone who lives and cares for an old dog with lots of issues including the odd seizure, I know how tough it can be. I also know the valuable lessons to be learned about living each moment, and appreciating the preciousness of life. The love and care are not only evident but inspiring. Thanks for sharing! Thank you for sharing this story. Epilepsy is scary and I know it can be a difficult diagnosis for pet parents. Having an opportunity for those pet parents to read stories and to realize they aren’t alone as they work on coming up with a strategy is hugely important. Thank you for helping to provide one of those resources. God Bless you for having such a loving and kind heart to care for these sweeties. Every animal deserves the best life, even with challenges! Thank you, Kristen! Kelly Ann is an amazing woman and someone whom I greatly respect and admire! This is such an excellent post. Kelly is a fellow Canine Epilepsy advocate and amazing Epidog mom I have come to know through Facebook. She is a strong advocate with (sadly) so much experience and knowledge from living with her beautiful Mastiff Epidogs. I admire her strength in sharing Riona and Fearghas’ stories and advocating for these amazing dogs to help educate others about the disease and not breeding a dog with Canine Epilepsy. I know from my own beautiful Siberian Husky Gibson that what these dogs endure with seizures and medications and side effects, is just heartbreaking. While they can live happy lives with Canine Epilepsy, it is not an easy path for the family. It is frightening when they seize, and they are forever on a strict regimen of meds, vet visits, testing, schedules, care, and love. THANK YOU! THANK YOU! for highlighting Canine Epilepsy and sharing Kelly’s story here. I also want to say thank you for listing my two books in your reference section. The more people learn about Canine Epilepsy, the better for the dogs and families who live with it every day. And maybe, I pray, one day there will be a cure. I will be sharing your wonderful and informative blog post! I can’t thank you enough, Dorothy! Not only for sharing this message and Kelly Ann’s story, but for all you are doing for the cause of canine epilepsy! God Bless your sweet Gibson and all he taught you that is now able to be shared with the world to educate and empower epi and non-epi dog owners alike. My focus for the next post will be breeding and genetics because I believe that is where the cure for canine epilepsy lies. I came here for the beautiful dogs, and just about ended up crying. I understand how important dogs of all sizes can be to people, as my dogs certainly are important to me. I appreciate how well you have handled your dogs’ issues and that you continue to love them. Thank you! These are my friend, Kelly Ann’s Mastiffs. I agree that she is an amazing woman with a heart of gold for her beautiful Riona and Fearghas! It must have been terrible to discover that two of your dogs have epilepsy. Is it a common condition in mastiffs? That’s a lot of pills to take, I’m glad they like taking them. These aren’t my dogs, these are a friend’s (Kelly Ann) dogs. 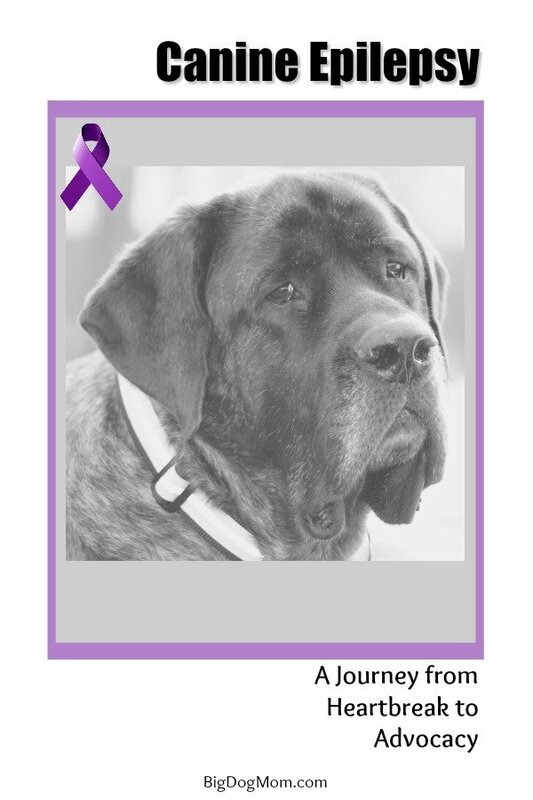 No, it’s not that common in Mastiffs, but there are enough cases of it to be concerned about breeding practices and how we can work together as a breed community to prevent it. Very interesting to read, and my heart breaks for them. I know it is a lot to care for a sick animal, especially more than one. I took care of a few children with severe epilepsy when was young. I had first aid training and volunteered at the Children’s Hospital, so parents recommended me to each other. I know first hand what it is to watch someone experience a seizure. It’s exhausting and scary. I hope they continue to progress and find the right dosage. Thank you for bringing awareness on the topic. I can appreciate why you would need to ensure that they have their own travel bags and kit! So important to do research on a breeder … I can’t believe people would be so irresponsible as to breed a dog they know has this. ugh. Yes, I agree, Sonja! It is despicable that some breeders are knowingly breeding dogs who are passing on epilepsy, but unfortunately, it’s happening. When I was very young, perhaps 8 years old, which would be 40 years ago, my mother got me a yorkiepoo. We came home one day to her having an epileptic episode. It was the most frightening thing ever and the most heartbreaking. Back then we did not have the resources we do now. No Internet to google support, what to do, etc. Even now with all of this at our fingertips as you say, it is an emotional roller coaster and very hard. We ended up giving my sweet Yorike to a lady who knew how to care for special need pets. My mother having been an animal lover her entire life knew we needed to find her a special new home. I am thankful she found someone to take my Yorkie but sad we had to let her go. Stay strong, you are such a great pet mama! Thank you, Joely! That had to have been very hard for you as a child, but for the best for your yorkipoo if you your family was unable to care for her properly. Canine epilepsy is one of the hardest diseases to live with, especially for the family. Thank you for a great post bringing awareness to this topic which I have been following on another blog also. I have learned so much and this is one illness that fears me with Layla as she ages. What makes me mad is that breeders think more of the money than the heartbreak and I suppose that is why I will not support breeders. Thank you, Ruth! Fortunately, the breeder of Riona and Fearghas represents only one of a great many wonderful and reputable breeders. But you are right in that it is despicable that a breeder would knowingly breed dogs that are passing on epilepsy. Thank you for writing this post, it must have been difficult for you but a very important story to tell. We have a border terrier, and they are prone to CECS (Canine Epilepsy). They have been doing genetic testing on border terriers and there is now a request for all potential border terrier breeds to have their borders tested for the gene before breeding, this is here in the UK. It is very important because it is so distressing for owners to feel so helpless when their dog is having an epileptic seizure. Thanks for sharing Kelly Ann’s story. I hope that breeders, in particular, will take her advice and be careful and avoid breeding dogs who have epilepsy. Like so many others, I first learned about Epilepsy in dogs from Five Sibes. Although I know it is tough to have an epi dog, I really am glad to know that the disease doesn’t prevent the dogs from living happy and full lives. Thank you, Beth! That is one of the blessings for sure, to see epi dogs able to run and play and live their lives to the fullest. I wish I could say all breeders are paying attention to this, but unfortunately, that is just not the case. It’s tough because so much about the disease and the genetics behind it are unknown. Part 2 of this story will be focusing on the breeding/genetic component because I believe that is really where we can impact the numbers of epileptic dogs that are being bred. It is always heartbreak that leads to the greatest deeds; isn’t it? I embarked on my dog health advocacy journey for the same reason. Would you be interested sharing the story with my readers also? Thank you so much, Jana! I would love to share this story with your audience. I will message you this week. This is a fabulous post, thanks so much for sharing the experiences and information, as well as resources. I can’t even imagine how scary it must be to go through this with not one but TWO dogs at the same time! There is help out there for families going through canine epilepsy. Yes, I agree, Cathy. Thank you so much! Wow I had no idea about canine epilepsy. Thank you for sharing such a touching story and testimony to bring awareness on this issue. So glad that Riona and Fearghas continue to fight and are doing the best they can despite the epilepsy. God bless the unconditional love of the parents because unfortunately there are some pet parents that would give up on them as soon as they realized the illness facing them. Yes, that is unfortunately very true, Kamira. I have seen one case recently where an epileptic dog (from the same breeder ironically) was PTS after trying to rehome her unsuccessfully. It was so heartbreaking to see that. Epilepsy is not an easy disease to live with or to treat and, you’re right, the parents who care for them truly inspirational. Kelly Ann’s story is equally inspiring and heart-breaking. Her comment about finding out who your friends are makes me want to give her a hug. Then she writes about the new friends she’s made because of this unexpected journey. People who get it. I can’t imagine having two big dogs with epilepsy. I completely understand how upsetting that must be for her to watch her pups suffer. Do you know if she’s developed strategies for trying to stay calm? I know when Bernie starts to throw up because his Addison’s Disease has flared up, I get upset. I try to self-talk about how this situation is manageable, and sometimes that helps. If she has other strategies for remaining calm, I’d love to read those! That is such a great question, Irene! I don’t know if she does anything specific to keep herself calm. Perhaps it’s just having gone through it for as long as she has, she knows what to expect. I will ask her and include that in my Part 2 post. Excellent post! I’ve never seen a dog or cat have seizures, but the thought scares me. Not because I don’t think I could take care of my girls, but because I had two gran mal seizures myself over 40 years ago. I was never diagnosed with epilepsy, but I was on medication to control seizures for 10 years. The doctors now think it was due to stress, but those memories are scary. Oh my gosh, I bet that was scary! I’m so happy those days are behind you! Thank you for sharing this valuable information, as well as your experiences. This can be such a scary experience! But the resources you share can make all the difference in a pet’s and their owner’s lives. I’m so glad that Riona and Fearghas are doing well. That was just so heart-breaking to read. I can only imagine how terrifying that is. Is CBD oil an option for treatment? I know of a blogger who is using it to control her pup’s seizures. I have never heard of CBD oil being used for epilepsy, but it would be worth asking about. Thank you for the suggestion, Jodi.